WELCO WEB DEVELOPMENT is a broad term for the work involved in developing a InternetWorld Wide Web or an intranet (a private network). Web development can range from developing the simplest static single page of plain text to the most complex web-based internet applications, electronic businesses, and social network services. A more comprehensive list of tasks to which web development commonly refers, may include web design, web content development, client liaison, client-side server-sidescriptingweb server and network security configuration, and e-commerce development. Among web professionals, "web development" usually refers to the main non-design aspects of building web sites: writing markup and coding. 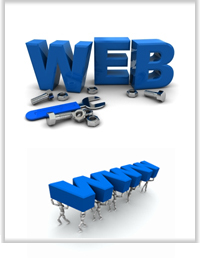 If you are looking for a Web designer or Web design company, you have come to the right place to our WELCO GROUP . Our directory lists website designers categorised both by location and by specialisation (e.g. general web design, graphic design, web designers specialising in database driven websites, ecommerce system developers etc).